archaic spreadsheet or note on your iPhone. 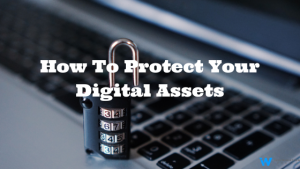 In this Month’s article, we’d like to discuss what “Digital Assets” are, how to better manage your online accounts and passwords, and why we think it’s crucial to consider these assets in your Estate Planning. What are digital assets? Think of any online account you own. You might immediately think of your Amazon account, your bank accounts, or social media accounts. Yes, those are digital assets. In addition, a digital asset can be content uploaded on websites including photos, blogs, music and documents. Some of these accounts hold value (both financial and sentimental), while others simply hold your personal information. For your reference, we have created a list of some of the most relevant digital assets and accounts that an individual might use on a regular basis. Have you ever thought about what happens to these accounts when you pass away? Hopefully your checking or savings accounts have a “Payable on Death” or POD feature that will allow your executor to withdraw the money to settle your estate. The bank would be notified of your passing, and the online account would eventually be shut down. If you don’t have a payable on death feature, the account could potentially go through probate if the total value, combined with other assets that aren’t owned by your Revocable Trust or have a beneficiary designation, exceeds a certain amount. It’s important to use a POD designation if your bank account isn’t in the name of your Trust. Do you know what happens to your social media or email accounts? This is an entirely different story. Typically, the service providers will have a clause in their terms (you know, that large legal paragraph that everyone “reads” before they agree to the terms and services) that states what happens to your accounts once they learn of your passing. But if someone needs to gain access to them, it will become immensely difficult if they don’t have your account login information. For accounts that hold actual value (think about a cryptocurrency account), this can become a larger issue. To illustrate this, a young man in Colorado tragically passed away, he did not have an Estate Plan and his family was unaware that he was a bitcoin investor. The young man had purchased the digital currency when it was $13 and we all know the history of bitcoin’s run up and, well, run down. They had no way to access his secure “wallet” (online account) so they had to take his documents to the company where it was held. The lesson here is that they were able to eventually recover and inherit his assets, but it was an inconvenience for the family in the wake of a tragedy. This could have been avoided if he had named a “digital executor”. I know what you might be thinking: Where do I even start? I just looked at my own passwords and online accounts, and I currently have 90 online accounts. I could not tell you how I accumulated so many. 1. Identify all your online accounts and make sure you have access to them. This might be a good time to shut down old accounts if you no longer use them. We have created a checklist of online accounts that most people use. Maintaining and updating this list will be crucial. Keep it in a secure location. 2. Retain the accounts that are most important to you and password protect them. How do you remember all those passwords? We recommend using an encrypted password manager to secure your passwords and make your life easier. Here are a couple of great services to look into: Lastpass and Dashlane. For Apple users, there is a similar service that is offered through Safari. These services have a free version and will allow you to store up to a certain number of passwords. After that, Lastpass and Dashlane charge around $2/month to get the full premium version. The best part of these services is that they integrate with your computer, your phone, and your tablet. And, you only need to remember the master password. Who do you know that’s technologically savvy and you can trust with handling these accounts? We wouldn’t recommend adding every single online account to your Estate plan (as they will most likely change over time), but rather naming your digital executor, providing instructions on closing out accounts, and finally, giving them authorization to use your password manager to access the accounts. They will need the Master password for your password manager as well as where to find the list that references all your accounts. Most importantly, we would advise against putting any passwords or online account information in your Will, because it becomes public information at your passing. Additionally, the state of California has created a law that permits a decedent’s personal representative or trustee to access and manage the decedent’s digital assets and electronic communications. Here is the exact law, should you be interested in perusing: AB-691 Revised Uniform Fiduciary Access to Digital Assets Act. Most states have enacted a law regarding digital estate planning as well. We believe proactively protecting your digital assets is an important part in managing your overall financial life. By planning ahead and providing clear instructions, your trusted representative will be much more efficient in locating your accounts and handling them in a manner that aligns with your wishes. You also avoid the risk of losing those digital assets that might hold value because your beneficiaries were unaware that you even had them.